BLUE SPRINGS - The floor is strewn with hay and only a few crumbled chalk boards remain to remind strangers that during its earlier years, the Union Center School was a grand schoolhouse. 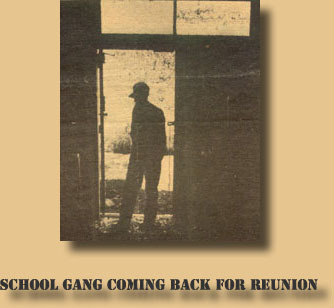 In August, the old school gang will be coming back to remember. Aug. 6 will be the fourth reunion of the Union School, which closed in 1952. The reunion will be a covered dish noon meal at the American Legion Hall in Wymore. All former Union School students, graduates, their parents teachers, school personnel and Union Center residents and their families are invited. Union Center was a community that covered about 17 sections, with the school being the pivot point, according to Robert Morris, a 1928 graduate. Morris is the only student who started a the school, graduated there and still is living in the area. "At one time, Union Center was on the map", according to Charles Trump, a 1950 graduate of the school, ''probably because gas was sold there." Union Center School was one of the first, if not the first, consolidated schools in the state, according to Trump. The highest enrollment was 135; the lowest was 40. The first reunion was in 1969. It attracted more than 300 people. "A lady in Lincoln (former student) go the idea," Trump said. "Everybody liked it so well, they decided to have more." The first two years that the school was in operation, it had only grades one through ten. From 1919 until the time it closed, it went through twelfth grade. kindergarten was added in the 1930s. Out of about 127 graduates, 116 still are living, according to Trump. Trump said he began with a list of 740 to locate for this year's reunion. He has 80 names yet to locate. Many of the students 270 are living in Nebraska. Sixty are in California, he said He has located 38 former teachers so far. Trump said that there was a country store across the road from the school that closed about the time the school did. The entire community shopped there, he said Trump said he remembered buying two doughnuts for a nickel and soda pop for a nickel at the store.